We are one of the prominent firms in offering a wide range of OTDR Testing Services in the market. Our provided products are designed using modern technology under the supervision of experts. OTDR (Optical Time Domain Reflectometer) is used for measuring Fiber length, locate fiber fault, fiber losses. We provide splice Fiber trace report through the ODTR test. We generate bidirectional ODTR report if it is client requirement. Our best quality of OTDR Testing Services is accurately designed utilizing superior quality inputs and is high in demand. We undertake OTDR testing job anywhere India. 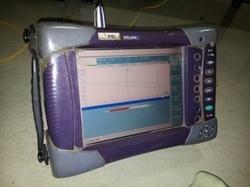 The fiber optic testing involves the use of an OTDR; or Optical Time Domain Reflectometer. An OTDR is capable of measuring fiber lengths, losses, connector losses, splice losses and fiber defects.